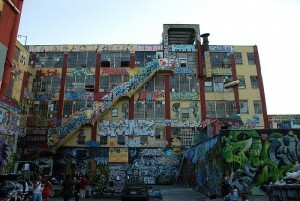 Several street artists have sued the property owners of the building in Queens that became known as “5Pointz”—a “Mecca” of graffiti and street art. This is the second such lawsuit, after another group of artists failed to obtain a preliminary injunction in November, 2013, and the owners whitewashed nearly all of the painting on the buildings. The new lawsuit seeks damages related to the whitewashing itself, alleging that it was done hastily and secretly without giving the artists sufficient time either to remove or document their work. It relies on the Visual Artists Rights Act of 1990 (VARA), the lone moral rights provision of the Copyright Act.